I visited Brazil for the first time in October 2006, when I spent five days in the Western Amazon, near the border with Colombia. 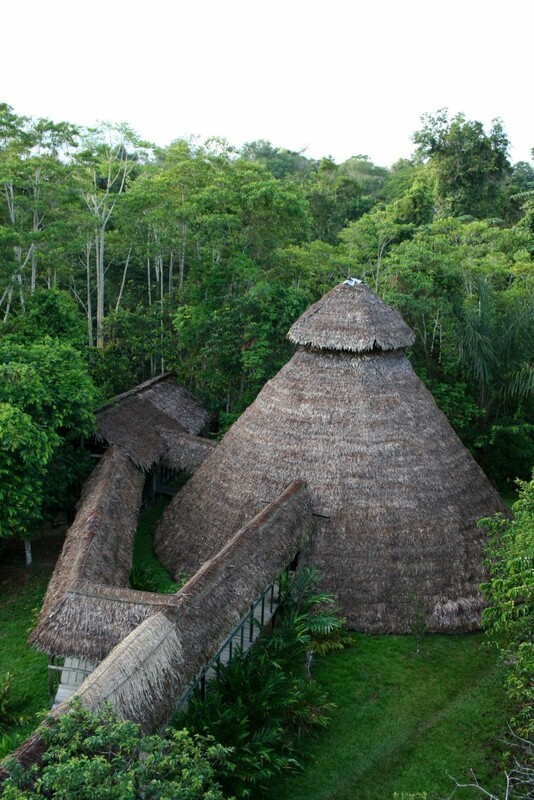 The Palmari lodge on the Rio Yavari is about 100km down river of Leticia, Colombia. I’d hazard a guess it sees more Colombian visitors than Brazilians, given Leticia is Colombia’s main entry point to the Amazon. I spent four nights at Palmari in October 2006 on the back of a work trip to Colombia. 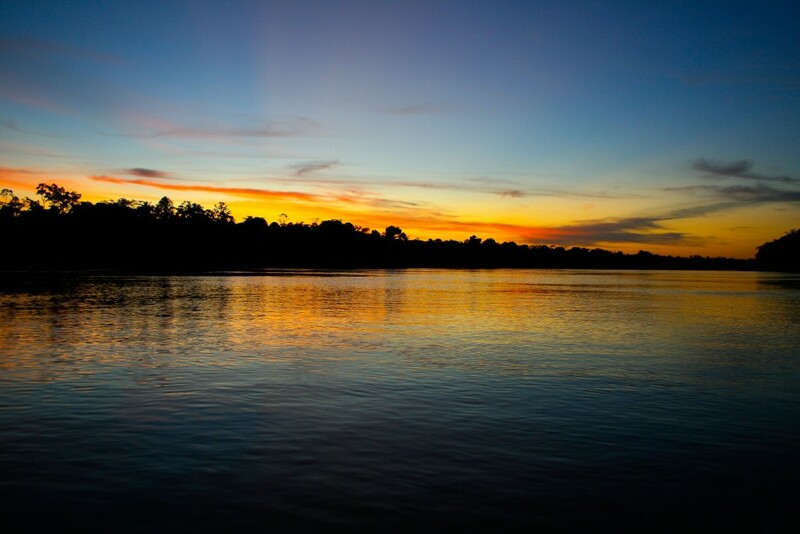 The lodge is on a bend in the Rio Yavari, a major tributary of the Amazon, and it is built according to a traditional indian design. It isn’t a luxury lodge. Indeed, so far as I could work out, there were no private rooms there, nor are the showers hot. But the food, while quite basic, was good (especially the pancakes and Brazilian donuts for brekky), and the staff were very friendly. When I was there only one staff member – the manager – spoke English. October is mid way through the dry season, though it wasn’t that dry. I tried questioning people about the best season to see animals and got some conflicting reports. March might be a good season because many of the trees are fruiting, while the May and June wet season, sees more animals in the higher – terra firma – forest behind the camp (these animals move to the floodplains during the dry season). But I suspect, truth be told, that while different seasons are better for different species, there is no single optimum time to visit. Other factors suggested to me that October/November is sub optimal. First, it was very hot and exceptionally humid: Northern Queensland was like the arctic in comparison (a slight exaggeration, but I could wring the sweat out of my tee shirt during the main heat of the day). 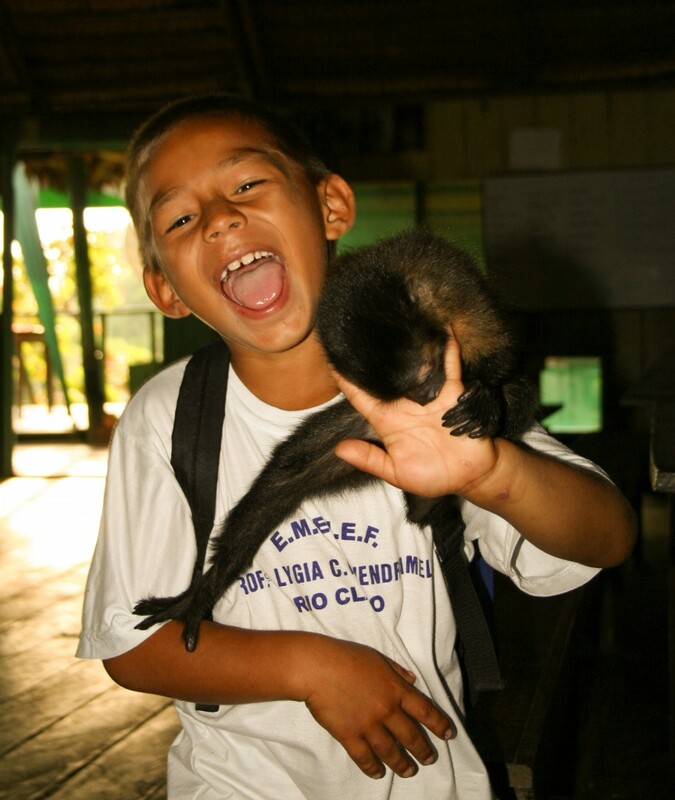 Second, it is school trip season in Colombia. During my stay at the Palmari lodge, the guest list comprised me and 51 students plus three staff from a Bogota school. The students were 16, spoke excellent English and seemed like a nice bunch of kids. But their presence wasn’t overly conducive to a peaceful wilderness experience. I shared a boat from Leticia to Palmari with some of them. Traveling down the Amazon, in the dark, in a thunderstorm, while 25 kids sang “Bingo was his name-O” in heavily accented English was fairly surreal to say the least. I can think of at least two friends who would be a considerable amount of money for a chemically induced recreation of this experience. But, never mind, because if you want to see mammals there you have to trek a good way into the jungle. Lack of time meant I had to settle for a three day/ two night trek. 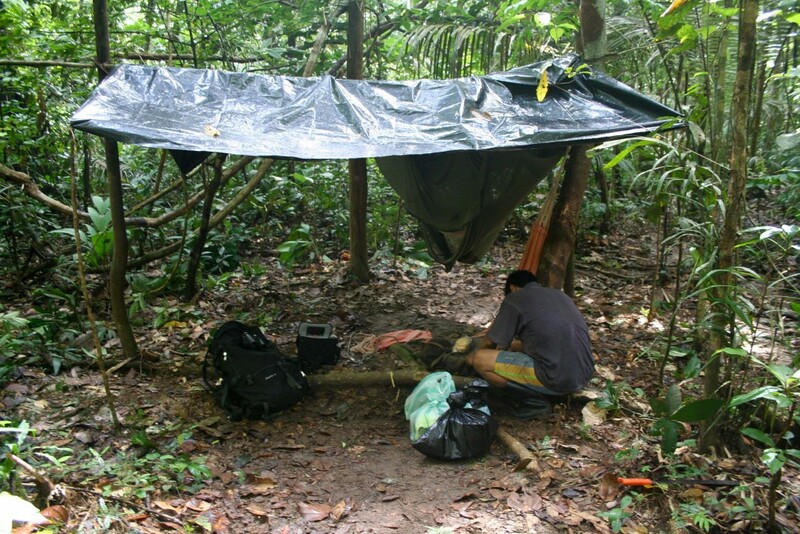 The lodge provided me with a local guide, a hammock (a heavy hammock – bring your own if you can), a mosquito net plus cooking stuff, some badly fitting rubber boots (bring your own too) and provisions. And off we went, me and my guide Mike. Mike spoke no English so three days with him doubled my Spanish vocabulary to maybe 20 or even 25 words. He was an awesome wildlife guide. One of the very best people I have ever come across for finding animals. He had lived his entire life in the area. Not only was he very good at hearing stuff and then finding it, he was also excellent at identifying things. One glimpse of a distant monkey and he’d tell me what it was – an ID I would confirm 20 minutes later after prolonged watching through my binoculars. When we reached our first night’s camp spot I indicated to Mike that I wanted to wander off for a few minutes along the trail while he got the fire going. Despite my broken Spanish I could tell that Mike thought this was a foolish idea. 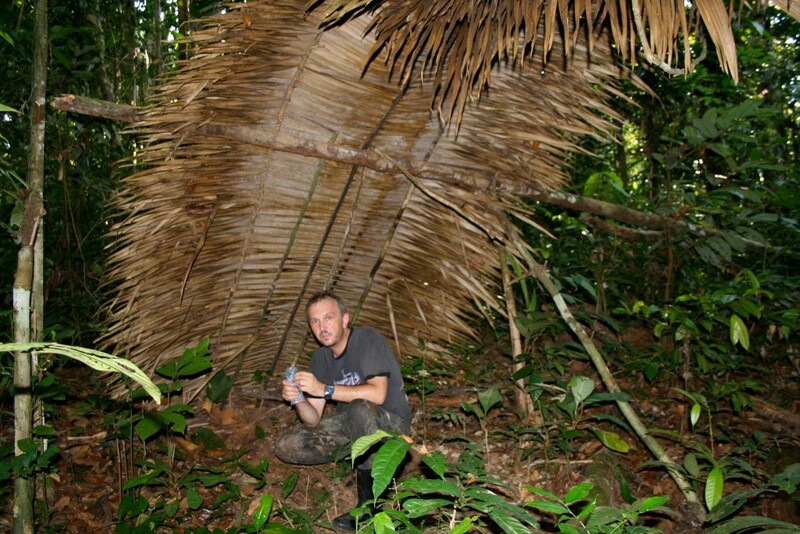 It seems that a race of crazy pygmies called the “Mardre de Selva” (forest mothers) were in the area. These “pequena personas” were, he said, “loco” and it seemed they would lure me away given half the chance, if Mike wasn’t at my side. We then heard one playing some pan pipeish type of thing. Now I wasn’t in the slightest bit worried by the snakes, tarantulas, wild pigs or Jaguars. But the thought of being taken out by some Amazonian equivalents of the cast of Deliverance, wielding pan pipes and blowpipes, rather than banjos and shotguns, had me uneasy. When I got back to Leticia I discovered that the “Mardre de Selva” are the local spirit people, that Mike, along with most of the locals, have unswerving belief in. More tangible though were the vampire bats. Mike, for reasons best known to himself, spent his first night with his leg hanging out of the hammock and his mosquito net. 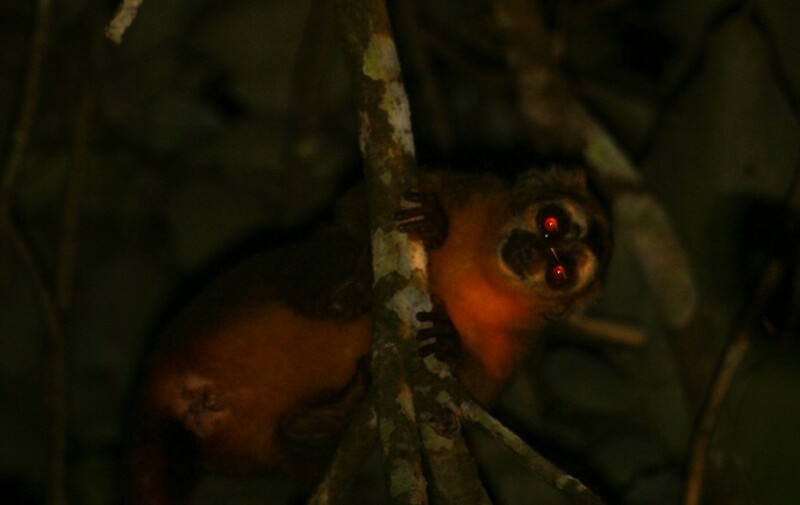 I was woken by the cries of an agitated jungle guide at 3 a.m. shining his torch on a bleeding toe. Now I was sorry for Mike, and more sorry that I had missed the bat. But I was also smugly pleased … about 15 years ago I had lost a pub quiz on the basis of a single question: “Where do Vampire Bats most often bite people?”. I’d said toe. The ‘answer’ had been neck. Convinced I was right I’d argued vehemently. But Kevin Chin, barman at the Cottage Loaf, had – as per bloody usual – refused to give ground. My one regret Kevin, is that it wasn’t you in that hammock. On the way into Palmari we saw plenty of river dolphins, both Botos (the pink river dolphins Inia geoffrensis) and Tucuxis (Sotalia fluviatilis, the smaller grey ones, with a much more pronounced dorsal fin). 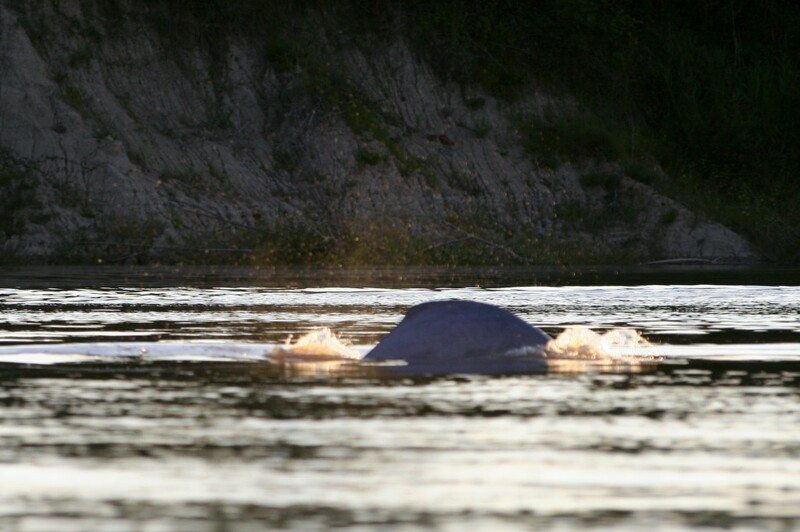 Small pods of animals were scattered all along the river right from downtown Leticia and we had good views of Botos by our canoe one evening just a few hundred metres from the lodge (indeed on the way back to camp I spotlit a dolphin for perhaps the first and last time in my life). In the grounds of the lodge I saw a troop of Common Squirrel Monkeys one dawn; a Kinkajou at night; a troop of Black-chested Moustached Tamarins (Saguinus mystax); another monkey that looked like a Tamarin but with an all black face that I haven’t been able to identify; a Black Agouti (Dasyprocta fuliginosa) at 9 a.m. and my one and only Squirrel – an Amazon Dwarf Squirrel (Microsciurus flaviventrer). We also (well Mike did) heard Pygmy Marmosets. 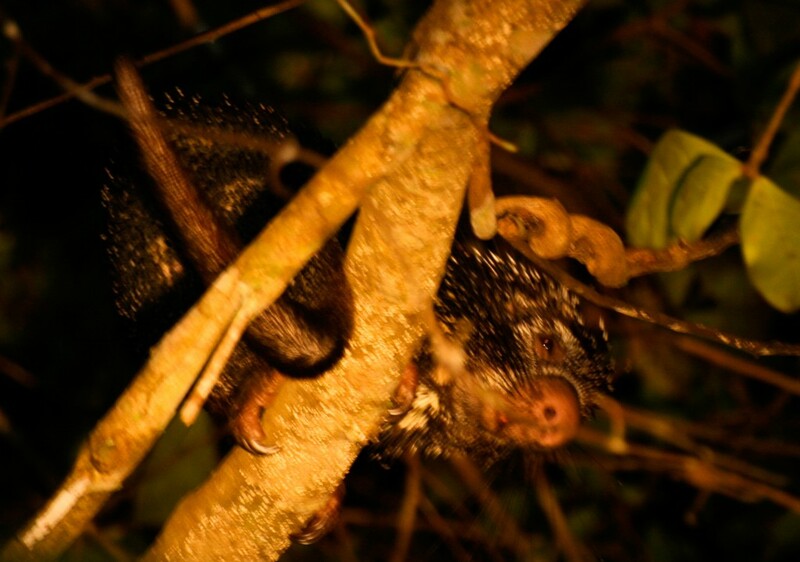 Across the river from camp, in some floodplain scrubby forest that we canoed to on my last night, we saw several Night Monkeys (Aotus nancymaae I think though the taxonomy of this group still needs work), a Brazilian Porcupine and another Kinkajou. We also heard several surprisingly vocal Brush-tailed Rats (at least Mike claimed it was this species we heard screeching in the night). But it was deeper in the forest where we saw the best stuff. Saddleback Tamarins were the most commonly seen primates. We also saw a large and very noisy troop of Squirrel Monkeys several times, and they were traveling with a few Large-headed Capuchins. 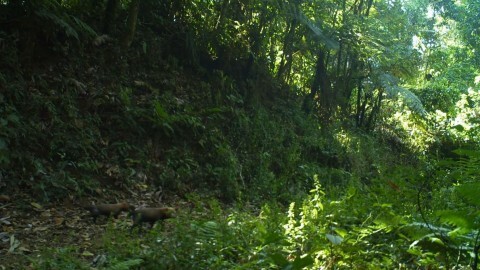 A couple of hours from Palmari we heard Red Howlers but, though we must have been right below them, couldn’t see them. But we did see a group of more active Coppery Titi Monkeys (Callicebus cuprous) which were reddish brown, with long grey tails. About six hours walk from camp on the second morning we saw briefly, but at quite close range, a Woolly Monkey, closely followed by an even briefer glimpse of a Monk Saki (much blacker than the greyish illustration in most of the books). Both species are reasonably uncommon close to the river because of hunting pressure. 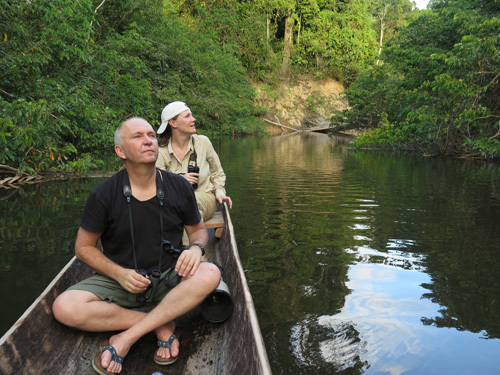 So, in all, we saw seven species of primates and heard two more. It was very very hard to get decent pictures of any of the animals, though some of the nocturnal animals were more cooperative. About four hours into our first day we had great views of a single Giant Otter in a brackish river. Although Mike reckoned they were not uncommon (nothing was uncommon according to him) the local academics were impressed as this species is apparently pretty rare in the area. On our first night we went spotlighting and Mike heard an animal moving stealthily past us. I couldn’t get the spotlight onto it, so gave it to Mike who in the excitement managed to disconnect the light. All I saw of the Short-eared Dog was the head and neck illuminated by Mike’s crappy torch. It would have been great to have had a better look, but a Short-eared Dog is an animal I didn’t think I had a hope of seeing and I was delighted to have got a glimpse. According to the literature this species is largely unknown, partly because of its sparse population and partly because of its secretive nature. My guess is that the Palmari area is something of a hotspot. Mike showed me plenty of field signs which he said were from this species, and I am sure he was right. Though I suspect they are quite tricky to see and I was lucky. We also had fleeting views of Collared Peccaries on at least two occasions, one very near the lodge. Spotlighting on the second night lasted 10 minutes before heavy rain began which continued for most of the night. Whenever I asked Mike about a species he’d say it was either present and common, or not present at all, and so it is hard to know what other species one might have a reasonable chance of seeing. But it seems that Pacas, Nine-banded Armadillos, and South American Coatis are all quite common. 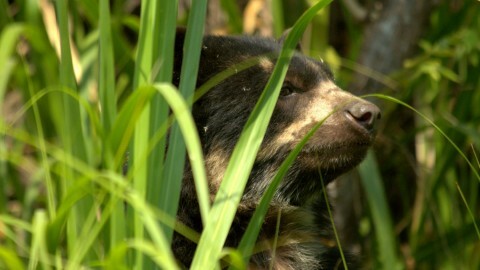 White-lipped Peccaries are around and Neotropical Otters can also be tracked down if you spend enough time. Tapirs are seen quite often (we saw plenty of tracks) and Mike also pointed to signs of Giant Armadillos on several occasions. Sloths are present, but hard to see because of their canopy lifestyle, and Jaguars, Ocelots and Oncillas are all present too. Hiking through the jungle was straightforward if a bit hot and humid. We followed a network of indian paths, some well defined others less so. There were many crossing over water that required balancing along fallen trees. Though it is possible to walk for as long as you want with a guide, I settled for two nights and three days. You need to come prepared, my guide didn’t have a first aid kit for instance. And, if you aren’t keen on fish then you might want to bring some dried meat to eat. They gave me several heavy cans of processed meat to carry that were eerily reminiscent of dog food in smell and texture and – I suspect – taste. Um ummmm.